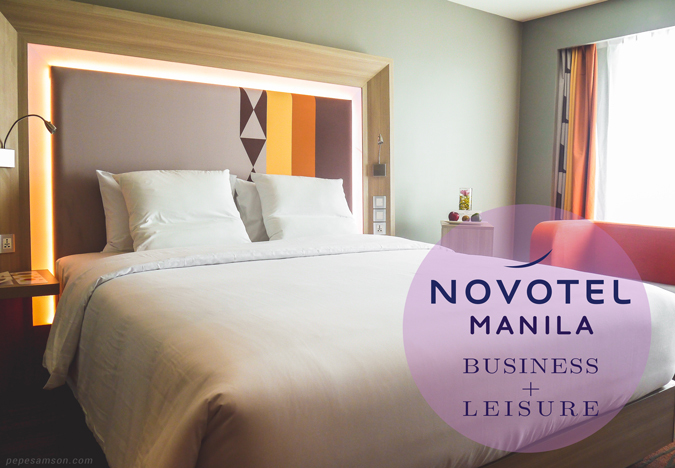 I instantly loved Gourmet Bar the first time I went to Novotel Manila. 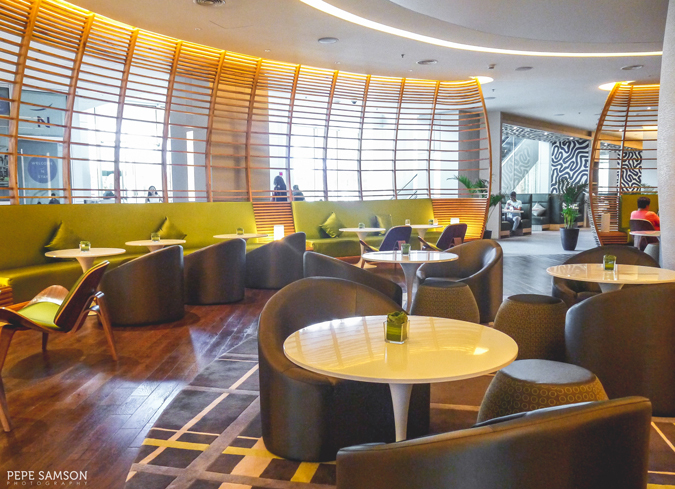 The hotel’s lobby lounge, designed like a modern tropical oasis, exudes a chic, casual, and relaxing feel—a spot perfect for all occasions: from coffee meetings and power lunches to laid-back dinners and after-work drinks. That’s why whenever I’m in the Cubao area, this restaurant is always a top choice for stopping by for a cup or catching up on some blogging work (or in some cases, a glass of their delicious watermelon mojito). Along with Gourmet Bar’s menu of Western and Filipino cuisines, the chef sometimes offers special items available only for a limited time—and recently, he has been planning to expand the selections as well. 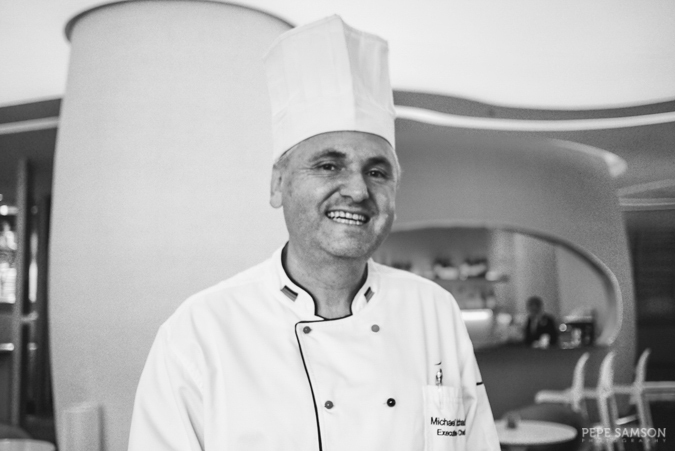 Some blogger friends and I met Chef Michael Schauss, Novotel Manila’s executive chef, a couple of weeks ago and enjoyed a sneak peek of some of the new dishes that he is planning to incorporate with Gourmet Bar’s regular menu. 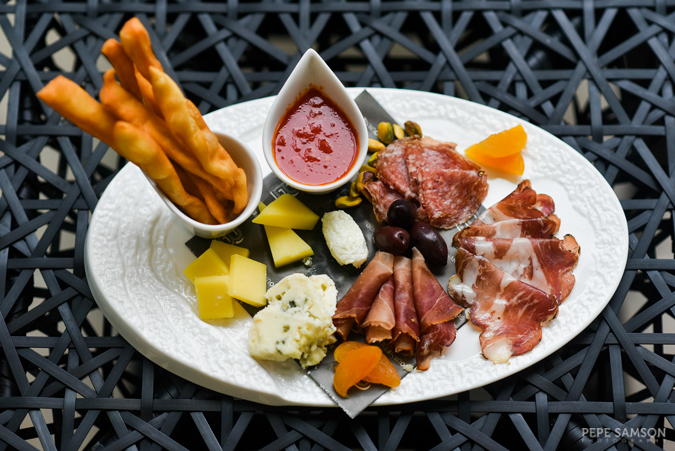 Unlike the dishes I’ve tried before—tasty sliders, flatbread pizza, and signature pastas—the new items gravitate more towards the finer side. Something diners would enjoy in a 3- or 4-course dinner. 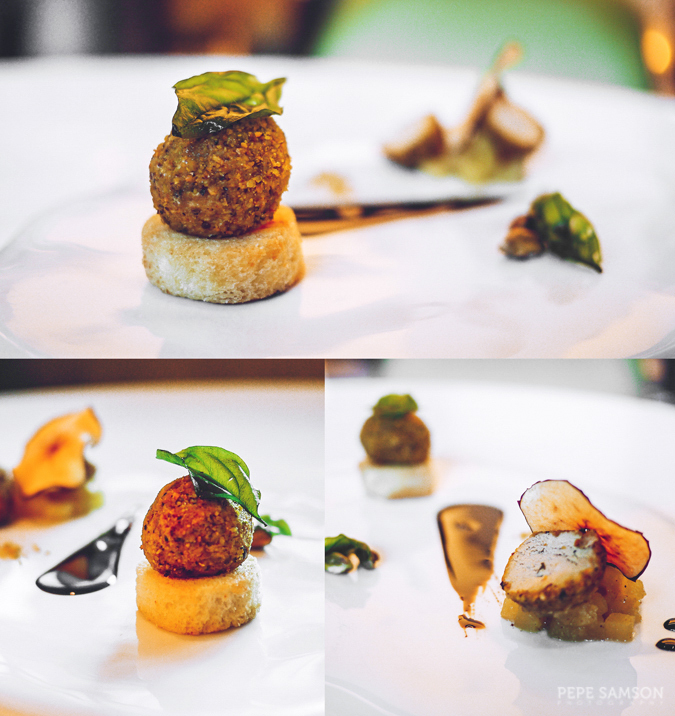 We started with the Two-Way Foie Gras—an appetizer plate consisting of two renditions of foie gras. The foie gras praline is as festive (and posh) as you can imagine; crusted with pumpernickel and infused with truffle, these creamy balls are perfection. The seared foie gras, on the other hand, lets you enjoy this delicacy even more in its simplest form—the only embellishment was a caramelized apple. This was quickly followed by an exquisite Scallop and Champagne Veloute, whose buttery flavor and silky texture are addicting; it was, needless to say, gone in six—not sixty—seconds. I love salmon (in all its forms), but I enjoy it most when uncooked. The Norwegian Smoked Salmon called out to me as if we were meant to be. With its beautiful presentation, I couldn’t decide whether to take photos of it forever or pop one into one mouth and foil everyone else’s #foodporn plans. It comes served with burrata and Avruga (herring) caviar. 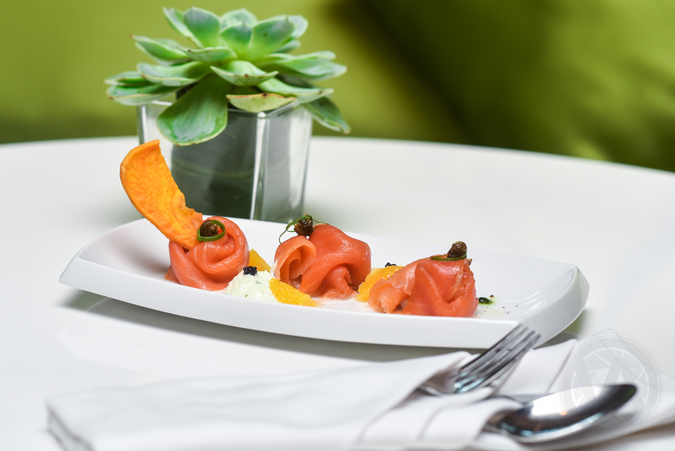 Pasta lovers, especially health-conscious ones, would find delight in Gourmet Bar’s existing selections, but the new dish called Ravioloni con Arogosta is also worth trying. This plump, pyramidal pillow of pasta conceal a delicious lobster filling inside. The lobster is sautéed in white wine and aromatics—its rich flavor explodes once you take a bite. 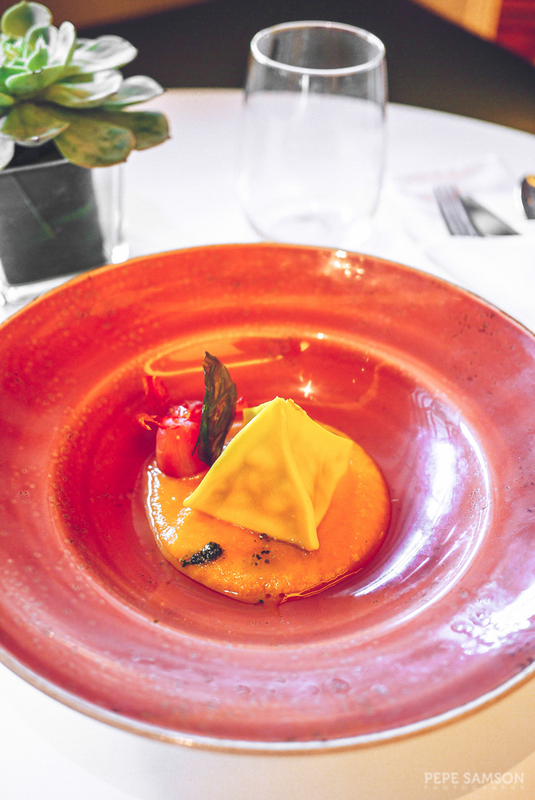 The tomato confit and carrot puree on the side are not to be ignored. Love risotto? Try Gourmet Bar’s Milanese rendition. 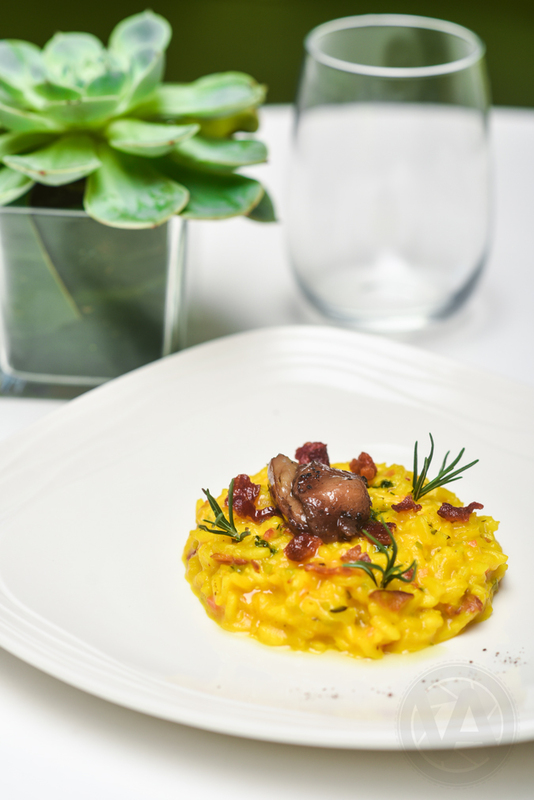 As if the saffron-infused Arborio rice isn’t sumptuous enough, the chef throws in some cheese, rosemary, and bacon. I could eat this dish on its own for days! 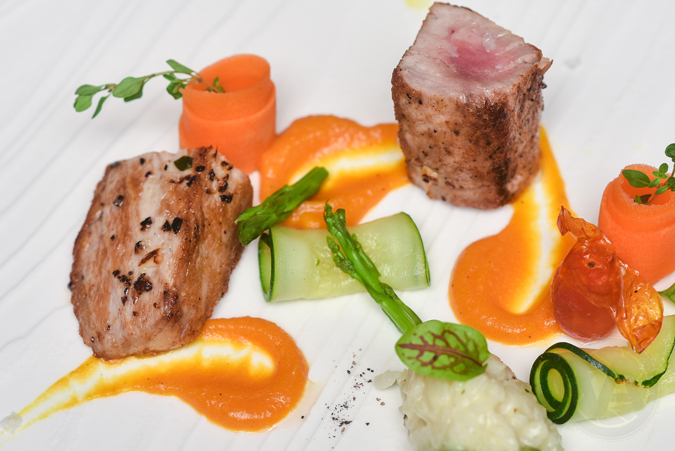 For a light entrée, the Seared Tuna Loin is a perfect choice. 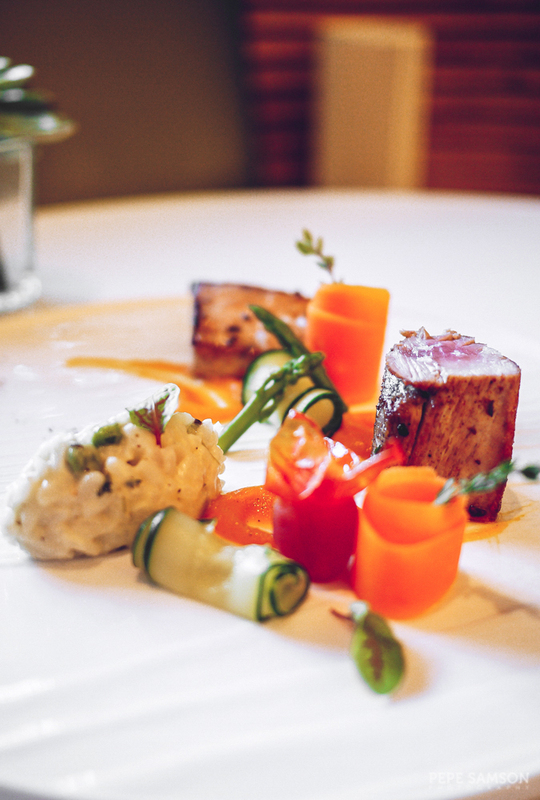 I enjoyed the flavorful, smoky, and moist tuna along with the fresh veggies, carrot puree, and green pea risotto. All the dishes served to us had seafood in it, and when the chef learned that one of us is allergic to seafood, he was kind and generous enough to whip up a vegetarian pasta dish which we all enjoyed. 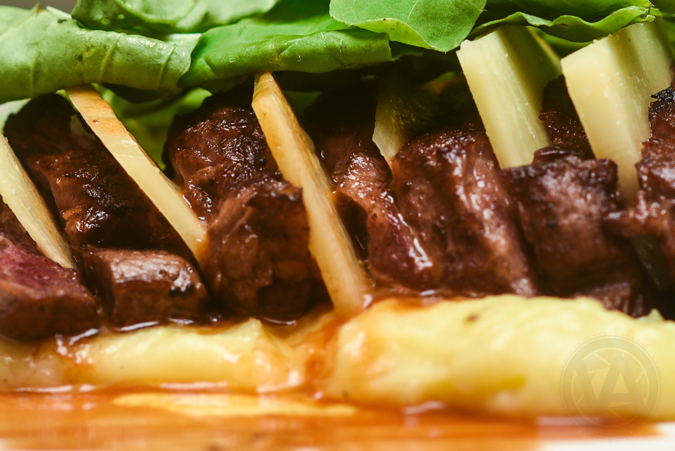 He also made us try Gourmet Bar’s delicious Tagliata di Manzo (PhP1,000)—sliced tenderloin served with mashed potato, shaved parmesan, and organic rocket lettuce from the hotel’s own farm. 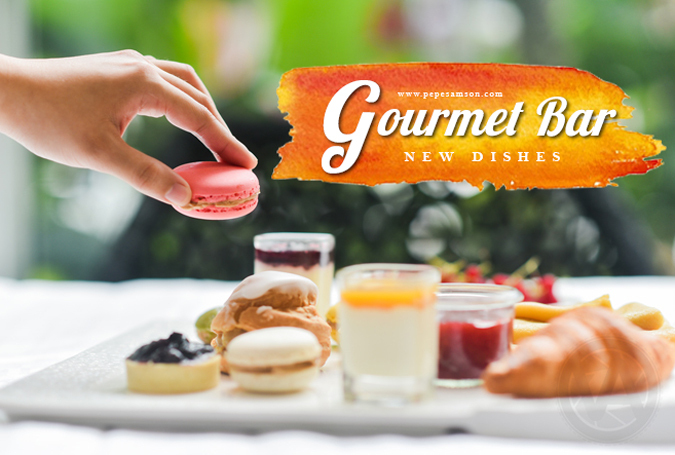 If you happen to come by on an afternoon, try Gourmet Bar’s Le Goûter, which is a selection of sweet and savory French nibbles like croissants, macarons, eclairs, panna cotta, jams, crepes, cheeses, and cold cuts. 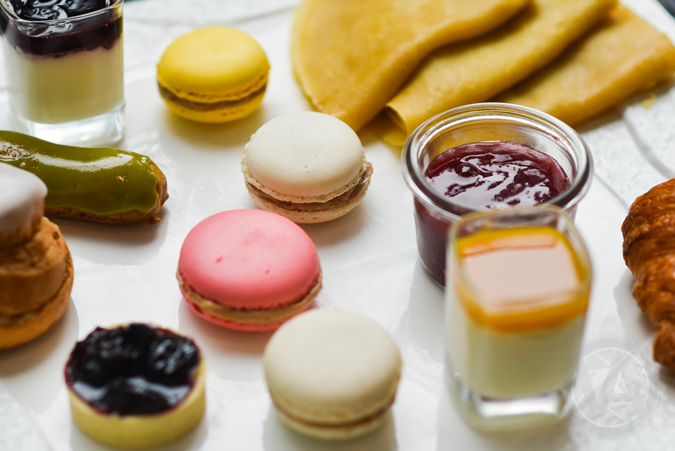 At PhP1,500, it’s good enough to be shared by 2 to 3 people—what a nice way to catch up over these lavish treats and tea! 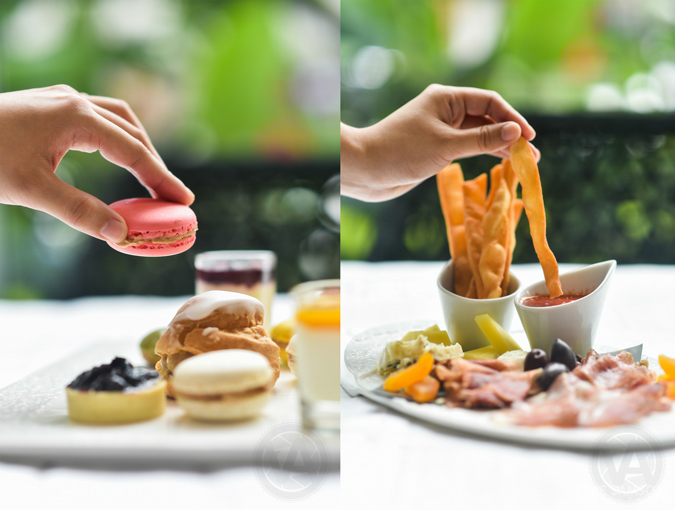 I find it very indulgent yet affordable, and it appeals to me so much because I love cold cuts, cheeses, and macarons. 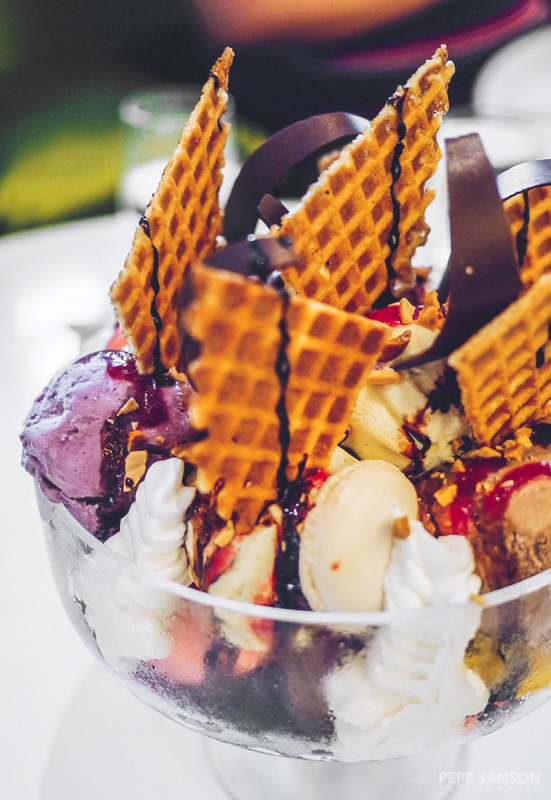 If you’re visiting with friends, accept the Le Mont Gourmand challenge and attempt to finish this wicked bowl consisting of 15 scoops of homemade ice cream, 15 of Chef Didier Derouet’s macarons, nuts, mixed berry coulis, chocolate and caramel syrups, whipped cream, and marshmallows. At PhP999, it’s a real steal as maybe up to 8 people can share this humongous dessert. The five of us finished it in less than 30 minutes. 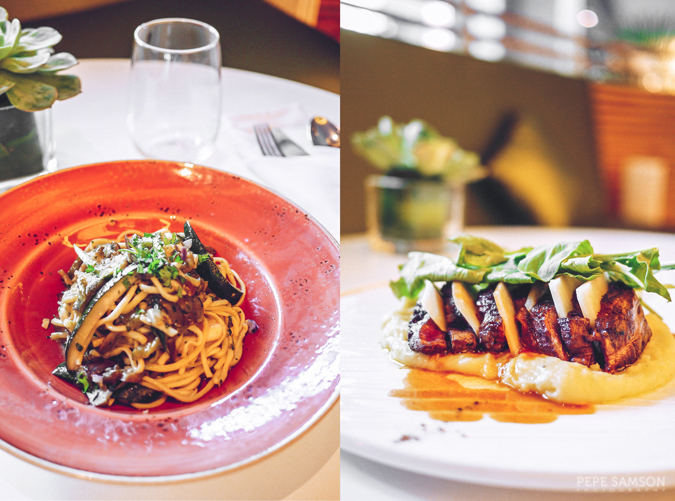 Overall, I enjoyed the new offerings at Gourmet Bar and I can’t wait to see them in their regular menu. Like the first time I dined there, I can’t wait to go back and partake of more of their tasty treats. Special thanks to contributing photographer Vin Aranas for the some of the photos used in this article. All photos without the Pepe Samson watermark are owned by Vin Aranas and are exclusively shared here with permission. 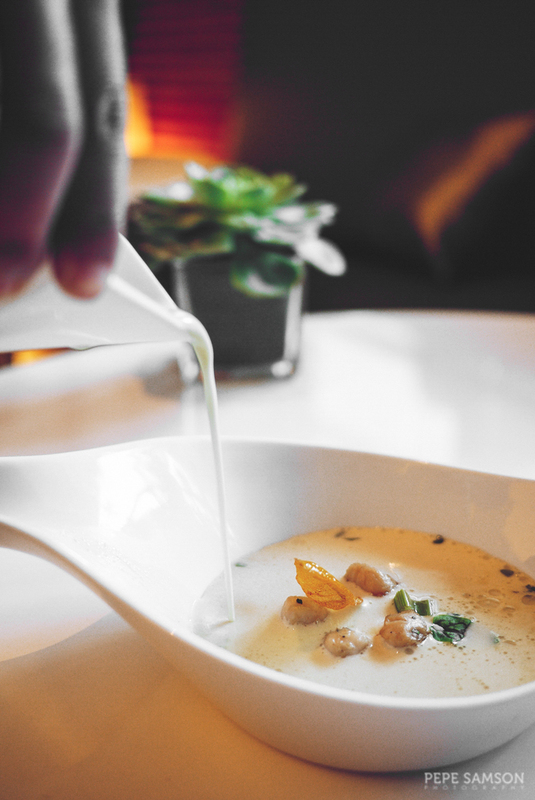 Have you dined at Gourmet Bar? What do you think of their new offerings? Can you and your squad finish the Le Mont Gourmand? 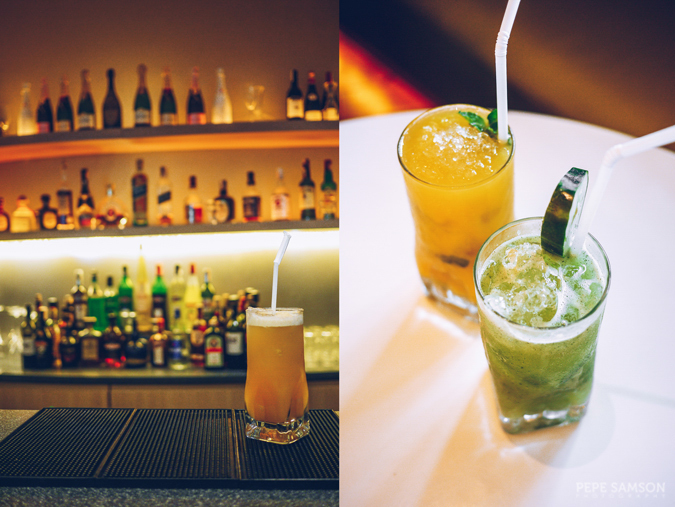 Exquisite Bar Grub and Cocktails by Serbesa MNL!